The No. 4 Virginia Cavaliers (7-0) won a big road victory at the No. 24, 76-71 Maryland Terrapins, winning their fifth consecutive ACC-Big Ten Challenge match. Virginia led nearly 17 players, but UMD came back in the match with free throws and late shots at three points. The Cavaliers had five double-digit players: Kyle Guy (18 points), Andre Hunter (15 points), Ty Jerome (17 points), Braxton Key (10 points) and Jack Salt all passed the mark of ten. points. . Salt had his best game of the season with 12 points (6-7), seven rebounds, one assist, one block, one robbery and no losses. Virginia shot 47% of the field, but returned the ball only twice and had seven interceptions in the game. The Hoos went 41% beyond the three-point arc and tied the 34 points of Maryland. Bruno Fernando of Maryland finished with a double double with 14 points and 11 rebounds in 6-8 shots. Anthony Cowan led the Terps with 15 points. The Terps shot 54% for the match, 55% against three in the second half. Hunter started the score with a slam dunk, but the Maryland Cowan tied the score at two each with a lay-up after sneaking behind the defense. A Jerome float put the Hoos up 4-2 before Fernando himself had a dunk to tie it up again. Guy gave the Cavaliers a 7-4 lead in his first three tries of the night, and Maryland responded with one of theirs to keep up. In the next possession, Hunter took a sharp look at a three and hit only goals, giving the Cavaliers a three-point advantage. A failed rebound by Hunter gave the Terps extra possession. This time, Jalen Smith was an imposing man who opened and discovered himself easily. Hunter led the alley and got the shot to fall, but Fernando responded to return it to 12-11 in Virginia. Maryland took his first lead of the game when Smith toppled Hunter for a bucket underneath, then extended it to 15-12 during a quick break following a missed shot. Guy missed a corner goal, but Salt kept the ball alive and found Guy in the same spot. He will not miss twice, equalizing the match once again. Both teams exchanged empty goods until Jerome burst three others after a fantastic move out of the ball. On the room, Clark cut the alley and curled up, followed by Jerome and getting the pass for all three. Cowan found Fernando for an alley to go 18-17 years old at the finish of the under-12s. Bennett opted for a more defensive composition by adding Marco Anthony, Braxton Key and Mamadi Diakite to the mix. The move paid off as the Hoos got five consecutive defensive stops and extended their lead to 25-17 with a time of 6:50 to play in the half. Two other easy baskets in the Maryland lane reduced Virginia's advantage to four points. Guy pushed him back to seven with a three pointer assisted by Anthony with two seconds left on the shot clock. Maryland, who was more aggressive on the glass in the first half, picked up a rebound at Key and made it 28-23 at 4:30 of the half. Key caught herself on the other end with a three-pointer on the right side of the arc, giving Virginia their biggest lead of the game (at this point) at eight. Darryl Morsell has reduced the gap to six points with a long fleet on Diakite. At the other end, Guy kept his burning hand with a long two that he turned into an old-fashioned three with the free throw followed (the first done by both teams). Key returned the Terps' favor on the other end of the field and Eric Ayala was able to reduce the deficit to 34-28 with just over two minutes left in the first half. Three more for Guy – his fourth in the first half – put the Hoos by nine. Fernando followed Smith's foul, but Salt faced his opponent for the strong rim, giving Virginia a 39-30 lead at half-time. Guy led the Cavaliers with 15 points in the first half on a 5 to 8 shot (4 vs. 7 of 3) while the Hoos shot 50% off the ground. The Cavaliers clicked from the ground in three points, logging 8 out of 16 attempts. Hunter added nine points in the first half and Jerome eight. Virginia did only one lap in the first 20 minutes and turned seven TOs in Maryland into nine points. Maryland shot 48% of the ground in the first half, allowing players to stay as close as they were. The three-pointers were not as strong, and Ayala hit his only pointer in three attempts in six attempts in the half. Fernando led the Terps with 10 points on 5 shots against 6. Guy opened the scoring in the second half with his fifth quarter of the game, banging on Fernando's outstretched hand. Cowan made a free-throw to reduce Maryland's deficit to 42-31, but an exceptional ball movement resulted in Salt's dunk. Hunter scored two free throws and Salt followed Guy's check to 48-31, giving the Hoos a good start in the second half. Aaron Wiggins scored the first two goals of half of the season in Maryland with three-on-two goals to narrow the gap to 11 in an instant. Jerome calmed the crowd with a float in the hallway to make it 50-37 with 3:24 to play. Things went wrong when both teams had a drought of more than 2 minutes, tainted with missed shots and foul calls. Morsell ended the Maryland drought with a free throw and Diakite's third personal foul (on an illegal screen) made the ball to the Terps at just 12 points. on the bench. Smith missed the free throw, leaving Virginia's double-digit advantage. Jerome hit another runner in the lane and Maryland returned on an ambitious pass in transition, their fourth of the second half. Virginia struggled with foul problems as the referees whistled nine Hoos faults in the 8:19 of the second half (Maryland had three in the same period). Serrell Smith Jr. reduced the deficit to 52-43 at 10:59, relieving No. 4 Cavaliers. Guy missed the clock and Hunter was called for his third foul on the rebound attempt. Morsell scored one of two goals, but Clark pushed back to 10 with a drive-up lay-up. Morsell took a step back two to reach 54-46. Salt stained Fernando strong, but the big man managed both attempts to throw free. Virginia striker Kiwi canceled the Maryland points with a powerful and thunderous dunk, giving the Hoos an 11-point lead just under eight minutes from the end. Two other free throws for the Terps reduced the lead to one digit, but a superposition of keys and key transitions gave Virginia an 11-point overlay. Wiggins closed the score at 61-53 with 6: 2 to play in the match on his second pointer of the second period. 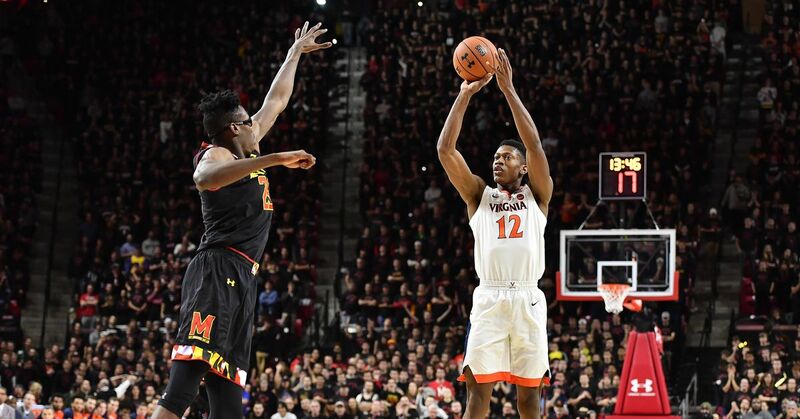 After several failed attempts on the offensive side, Fernando shot the Terps within five minutes, with five to play, while the sold-out spectators made themselves known. Three missed by Clark came out of Virginia, giving Maryland a chance to make this match a possession. A Cowan layup made a four – point match, but Salt followed a missed miss to bring it back to six. Wiggins simulated a three and logged on a long two to land the Terps at just 63-59. Jerome struck in cold blood three to give the Cavaliers a seven point lead three minutes from the end. Ayala managed to reduce Maryland's deficit to six, and another following Salt added 68 to 60 points to the Hoos. Cowan scored points, but Hunter delivered another extremely brutal dunk to give Virginia a little more breath. One Cowan three reduced his maneuvering margin to only five points: there are 54 left. Jerome approached the line and missed the front of the first and first goal, but Key managed a huge block on the other end and the Cavaliers were able to correct the ball in less than 37 seconds. The Terps again made a mistake on Jerome and he managed to give Virginia a 72-65 lead. Wiggins doubled a three, but still managed to stop him despite Key and Hunter's attempts to block the shot. Key was fouled and converted both on the line. Hunter got a three-try piece from Wiggins, and Key went back to the line to try to play ice cream. He hit one of the two, and Ayala responded with yet another three pointer to keep him in all four. Clark missed the first of his free throws, but managed the second and the Hoos overtook the clock for a 76-71 win. Next time, Virginia will host Morgan State on December 3rd.